“Nordic nature is our greatest inspiration in all our products – in both colours and materials. We want to bring the harmony of Nature to our customers’ homes and accessories”, says Katri Kempas, the creator of the brand. Katri explains she is equally inspired during ski trips in Lapland, in a forest while picking up mushrooms, or by the seashore. Scandinavian nature and maritime lifestyle are part of the Kempas Family’s everyday life. In addition to his wife, Mikko Kempas has another great love in his life: the seasonally-changing, roughly-living sea. The scale range from lovely glittering sea to ruthless surging waves has affected the Nordic Swan Living’s portfolio. The Kempas family also owns a boating business, and some of the products have been developed for its purposes. Products that endure all conditions in the changing nature are a natural part of the brand selection. The Kempas family has grown, resulting in Katri’s design work to further emphasise the sustainable values of the Scandinavian lifestyle. “We are privileged to live among such nature. We feel obliged to leave the splendid experiences of nature to the next generation as well”, Katri explains. 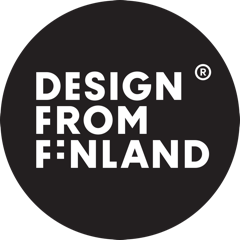 Sustainability, quality, and Nordic values are the basis of the Nordic Swan Living products. These values are stronger than trends – they create and sustain happiness for a long time. “Most of the materials in our products are locally produced. We acquire materials also from abroad, among traditional livelihoods and cultures, where, over millennia, natural materials have been shaped to endure and to protect people. “We can make our daily grind, and even the world, a bit better by each choice we make", Katri sums up, and lifts her new-born baby from the pram to her arms, while the toddler big brother munches some blueberries next to her.